On page 12 of the September issue, you’ll find this puzzle about an eco-friendly school. Here are chickaDEE’s top 3 tips on how to help your school days be green! This could mean using both sides of the paper or using scrap paper. Also make sure to recycle paper that you don’t need anymore instead of tossing it in the trash. 2. Turn off the lights. Remind your friends to turn off the lights when there is no one left in the classroom. On bright and sunny days, ask your teacher if the lights can be turned off in the classroom. 3. Bring a litterless lunch. Help your parents pack a lunch using only reusable containers. If not all of your containers are reusable, make sure you recycle whatever you can. 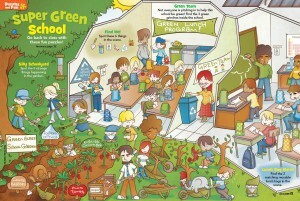 Do you have any more ideas on how to make your school a super green place? Leave a comment! Be Kind to the Earth for World Environment Day! My school is super eco-friendly because of this club we call, “Green Team” We compost apple corns, fruits, vegetables and much more. The Green Team makes sure that no juiceboxes, paper or cardboard are thrown away. Instead, we should recycle them. We always try to turn on the lights when we really need it and turn off the computers when we finish using them. Every Fridays, we don’t bring a lunch. instead we eat things from our garden like tomatoes, and green pepers. Our school is 100% eco-friendly because of the Green Team. We also make sure the water tap is off and we try to not waste our resources in our earth we have left. Our school has a compost bin, a recycling bin, a paper bin, the paper bin is used for the Green Team to check that you used both sides of the paper and you are not leaving out so much paper because, sometimes we could reuse the paper. (for example your teacher just printed out something and didn’t need it anymore. We could use the back of it. Who cares if there’s something on the back? Please Reply. Three cheers for Oscar’s school! Oscar, I think we can truly call your school a super green school. I especially like the part about eating vegetables from your garden. Keep up the good work!